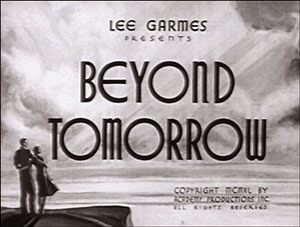 I found Beyond Tomorrow listed on a list of theatrically released Christmas movies I found on Wikipedia that we're using as a checklist. I didn't remember ever hearing about it, so I added it to my Netflix queue. But before it came up, I found a copy in one of our bins of unwatched Christmas DVD's. Actually, I found two copies; one in a compilation, and another remastered version. I'm starting to think we should invest the time to re-organize our collection. I should probably mention that the remastered version was also re-branded as "Beyond Christmas." That was released in 2004 and included a color version along with the original. I'm not sure if their were legal reasons for the title change or if they just thought it would sell better with the word "Christmas" stamped across the top. The movie has a lot in common with Bell, Book and Candle and The Bishop's Wife, though it seems to be even less well known. It's a shame, because - aside from one very unfortunate decision late in the movie - it's a pretty phenomenal film. The story opens by introducing three elderly businessmen living together in New York. All were intriguing and likable, even the Scrooge of the group. After their dinner guests cancel on Christmas Eve, they make a wager on whether if they toss wallets out the window containing ten dollars and their address, any will be returned. The optimist of the group plans on inviting anyone who shows up to dinner, thereby solving their lack of guests. The first wallet is returned by a handsome young man with a great singing voice, the second by a beautiful woman, and the third isn't returned, at all. Of course, the three old men befriend the pair, who are a couple by the end of the night. This sequence is about as light tonally as is possible. It's sweet, funny, and fun. The banter and genuine goodwill of the world remind me of things like Amélie. It takes a little more than a third of the movie's run time to move to the next act, which starts with the three old men - the movie's protagonists - dying in a plane crash. Bet you didn't see that coming. Don't think they're out of the picture, though. Their ghosts return home, and they're able to subtly affect the world and those around them. They give characters premonitions, and they can casually move objects that could have moved by chance. They continue operating as they did in life and try to bring their loved ones whatever happiness they can. Only their interference goes wrong. They nudge the young man into trying his hand at show business. He's successful, but in the process becomes involved with another woman. As the movie progresses, things get even darker. The afterlife has rules and properties. And one of the old men didn't exactly live a spotless life. For the most part, I like the story's resolution quite a bit. But, like I mentioned at the start, there's a pretty massive caveat. This time, it's the aforementioned "other woman." There's fundamentally nothing wrong with the character or her actions, at least not from a modern perspective. The dark cloud following her is nothing more than a divorce, which has resulted in a jealous (and ultimately violent) ex-husband. The movie's judgment on her is a sickening example of victim-blaming far too extreme to be mitigated by its era. However, I found the rest of the film so intriguing, I'm recommending it regardless. Just be aware anyone with a soul is going to cringe at least once. Updates frequently between Thanksgiving and Christmas and sporadically during the dull seasons. Got a tip related to these joyous holidays? Pass some of that yuletide cheer our way by clicking here.